This is our current "active list." Many other tunes are possible as requests. Serenade performs both as an acoustic group with light amplification for shows or moderate sized dances, or as an electric instrument setup for larger dances. 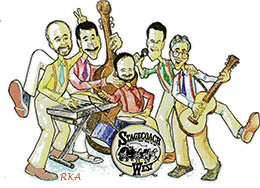 Stagecoach West and Sharky and the Fins appear with an electric instrument setup for medium and larger dances. Most of the tunes listed below can be done in both setups and by all groups. A few tunes, however, are probably not suitable for the light acoustic setup.